Truth be told, there were about twenty people on the i.d.e.a. team who made Funner, California a reality. You know who you are! But three in particular really brought this magical idea and eventual place to life including mythical creative director “Scojo” (yes, one name is deserved) and ACDs Austin Lane and Joe Nafziger. Often the people who do the most work on an assignment get the least amount of recognition. My hope is to bring these three deserving bright minds to the forefront of the Funner, CA conversation. Berman: Guys, thanks for “eJoining”. Scojo: Thanks! It’s always fun to talk about this stuff. For me, it’s like beer or rock and roll. It makes me happy. Plus, I’m terrible at most other things that involve my brain. Nafziger: It’s nice to be here on email with you. Thanks for hosting us on your server. Berman: How long have you been working on Funner, California? Nafziger: The specific concept of rebranding Harrah’s Resort SoCal as "Funner, California" was something Austin and ScoJo came up with at the end of 2015. I’ve been working on it since the beginning. Scojo: It was more than a year in the making. With a ton of resort destinations out there claiming “fun” and Harrah’s always being more fun than its direct competitors, we worked with our strategy team to develop “fun made funner” as a new positioning. After a few initial executional ideas that included having “Funner, California” on road signs showing the distance to this destination, we felt like we found a bit of gold. It became much bigger than an execution or campaign. We wanted to literally rename the destination. Lane: We went to present OOH concepts with a big focus being on spectaculars. We like to present with loose print outs to encourage the group to walk around and not to just look at a screen. The last print out we laid on the table, was a road sign comp with “Funner 7 miles” on it. We pretty much said, let’s not just make our OOH executions more fun, let’s rename the whole land. And that’s how Funner, California was born. Nafziger: Once we saw how much potential it had, we were very excited to share with the client and see if they felt the same. Berman: We obviously talk quite a bit about courageous ideas here. I think we can all agree that Funner, CA fits the bill. You found a way to change the name of the land the resort sits on. Prior to presenting this, was there any concern along the way that the client (and tribe) over at Harrah’s would not buy in? How have they been to work with? Nafziger: I get anxious presenting big ideas. You wonder if you’ll do them justice when you share the concept. Wanting to get your client to approve such a big change in their marketing takes a lot of trust, and after more than four years of working with the Harrah’s team, that trust existed. They got it right away. Plus, they are the best people I’ve gotten to work with in more than a decade so all you want to do is what’s best for them. Scojo: Our client was amazing, supportive and one of the best client partners I’ve worked with in 17 years of being in this industry. Berman: I would call the look of Funner, CA timeless and aspirational. Lane, you have probably put the most hours on the look and feel. How would you describe it? What were you going for? Lane: The look and feel draws inspiration from the classic throwback “greetings from” postcard design. We definitely evolved it to make it our own by using amenities from Harrah’s and additional cues that represent the SoCal vibe. Overall, we wanted it to feel classic, somewhat tongue and cheek, and aspirational. Berman: At what point did you bring in the idea of finding a Mayor? Care to share any of the other potential Mayor candidates? Scojo: Once we knew we were creating a new magical “city,” we felt it was only right to have a mayor. The Hoff was perfect for this launch. We had several celebrity candidates who shall remain anonymous at this point, in case those individuals end up serving a term. I do remember selfishly pushing for Gene Simmons early in the process, but he didn’t make the final cut. Berman: What was it like to work with ‘Mayor Hoff’? Scojo: Pure awesomeness. I still live in the 80’s. So for me, it blew my mind to be telling Knight Rider to slow down on the Red Bulls. He loves that stuff. He’s a good dude and I’d work with him anytime. Nafziger: I had a blast. 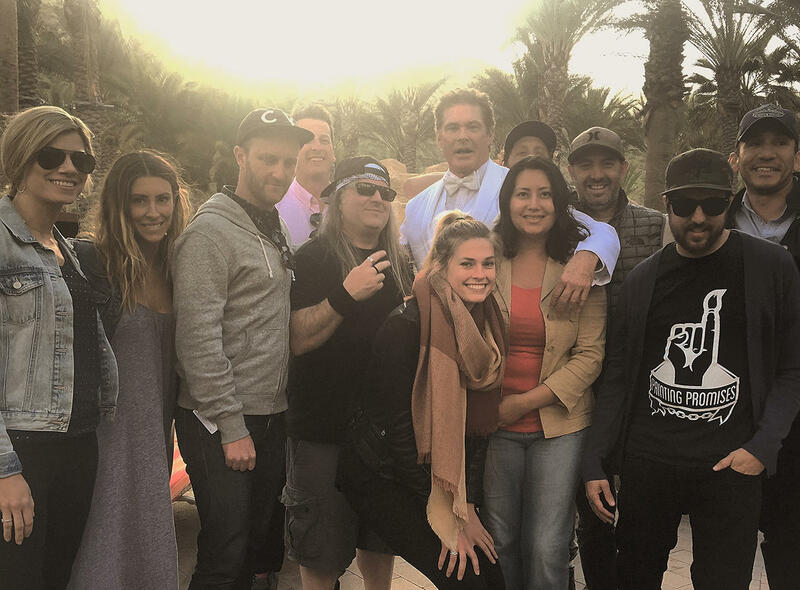 Hasselhoff is a pro, and is very much “Hollywood." If he doesn’t like something, he will tell you. But he understands his appeal, and plays to it. Lane: Dude. Who doesn’t like The Hoff? We knew he would be the right guy if we could get him. He fit the tone for sure. Really, he was amazing. Super friendly and always had a good story to share. It’s still crazy thinking that I was given the opportunity to work with him. This for me, is just another one of those things I can add to the list of amazing moments I’ve experienced due to the job I have. I’m thankful of that. Berman: What I personally love most about Funner, California is that it’s not a mere advertising idea, but it's a true courageous business idea. For me, it’s the fact that you now walk into the store on property and there’s merchandise with ‘Funner, California’. Or that their employees have fully adopted the Funner, CA mentality. What’s your personal favorite part of the Funner, CA idea? Scojo: Truth be told, my favorite part of this entire process was working alongside a client who was as passionate about bringing this idea to life as we were. They committed to altering their actual business model in many areas. It doesn’t happen without the right client partner. You know it’s an amazing situation when you leave each client presentation more fired up and inspired than when we walked through the door. Nafziger: My favorite part of the Funner, CA idea is that it forces us to try to make each media placement “funner” than normal. It’s a mindset that is now embedded in our minds and the minds of the clients. Lane: Ah man….That’s a tough one. It’s easy for me to jump into saying “the work of course.” But, in all honesty, one of my favorite things about Funner, CA is the partnership it has created with us as an agency and everyone at Harrah’s. We already had a great working relationship, but this just took it to a new level. Sounds like marketing talk, but it was a true collaboration. They had to live and trust in the idea as much as we did. Any great idea has to have a partner that is willing to do the same. The team there did the whole blood, sweat, and tears thing just like we did, and they’re still doing it. It has just been great to see the team at Harrah’s living it. It really has. Berman: There really were so many people who were part of making this a reality. Can you give a few shout outs to those who brought Funner to life? Scojo: Amy Winhoven, for her insights and "killer idea" recognition abilities. Sarah, for juggling chainsaws and hand grenades with such grace. Daniel Andreani, Ryan Berman, and Nathan Smith for trust, guidance and love. Lizzie Schwager, Annie Tomasek, and Jihan Elgibali for keeping it all rocking. Lane: I’ve gotta give props to Scojo and Joe Nafziger. No doubt. It would not be what it is without them. Props to everyone at i.d.e.a. Daniel, Ryan, Amy, Sarah, Nate Dogg, Lizzie, Annie, Eric, Mario… Huge props to Dugan O’Neal for bringing his magic and directing magic, Ben Gilovitz, James Whittaker, everyone at The Director’s Bureau, everyone on the production team for everything they do, Fred at Refuge VFX, Joaquin & Austin at HutchCo, Ricky Gausis at MPC, Kate and the crew at BeaconStreet, the whole team at Harrah’s, Darrell, Amber, Kelly, Beau. And the Hoff of course. Nafziger: We got to work with such pros on this project. Just the coolest people: Amber, Aaron and Kate at Beacon Street Studios; Joaquin and Austin at HutchCo; and Dugan and Ben at Director’s Bureau. Berman: Now that it’s live, any final parting words on the campaign? Or care to share what’s coming next? Nafziger: There are three new TV spots that launch May 22nd. I love them all. This has been the best project I’ve gotten to work on in my career, and hope to do even more Funner work in the future. Scojo: Yeah, our brand campaign starts soon - it’s different from the Hoff teaser and I’m really proud of it. Other than that, I wanna say thanks to my two Funner brothas - Austin and Joe. It’s happily fitting that for “Funner” - I’ve never had so much fun bringing an idea to life. Lane: It’s where your wildest dreams dream. Ryan is a founder of i.d.e.a. -- a fully integrated “courageous ideas" agency based in San Diego. After a decade working in New York, Ryan moved to California to write screenplays. Instead, he has been living one.